To celebrate 100 followers, we're having a little giveaway! Müsli Mouse is a handmade jewelry boutique, and one of you will get to choose something(s) up to $16. There's some really cute stuff there! - If you haven't already, become a follower! -Pin the blog on Pinterest! posted a link on face AND pinned. Great giveaway. I really enjoy your blog. Some day I will get to 100 followers. I would choose Laser Cut Earrings - Black Filigree Earrings. I love the coral cabbage rose earrings! Congratulations! and I love the new look BTW. Really lovely. Ooo Giveaways?! You guys are kind of a big deal now. Congrats! 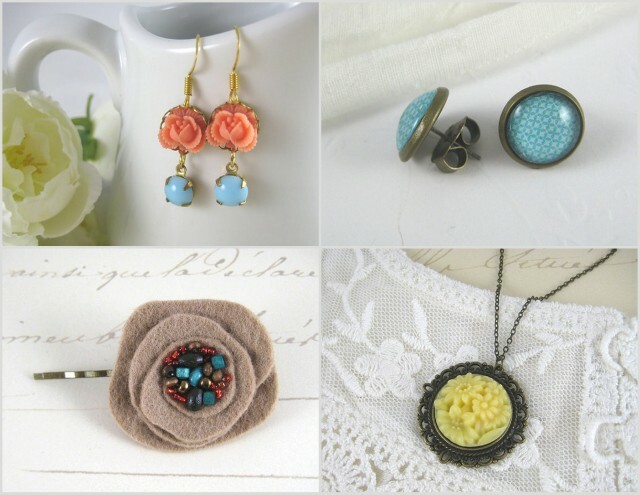 Love it all, but would probably choose the cabbage rose earrings! I follow and I like the Felt Flower - Customize as Brooch or Hair Pin. Thanks! It's been a long time since I have been on your site and I love the banner and design! Beautiful.